Bellatrix, I'm a Pug! : ORB Update! First...everything was O.K.! My orbs are just fine. Let's backtrack to this blog post: Allergies and Eyeballs. Notice the pic with pigmentation growing in the middle of my orb? That was really the start of Mums and Daddy getting concerned about my orbs. 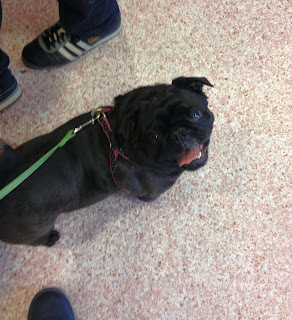 Then, I started getting all sorts of eyeball infections, and a bunch of trips to the Vets followed. I was eventually seen by the ultimate doggie-eye Doctors, Dr. Hacker and Dr. Zafross at Animal Eye Specialists. The decision was made to make my eyeballs smaller, in order to ward off the various bulging eyeball problems that I was having. Since then, I have to get my orbs checked twice a year, and use special medicine in my orbs to keep them healthy.Currently, the pigmentation is totally gone! My orbs are at FULL POWER! Watch-out, world! Hi! 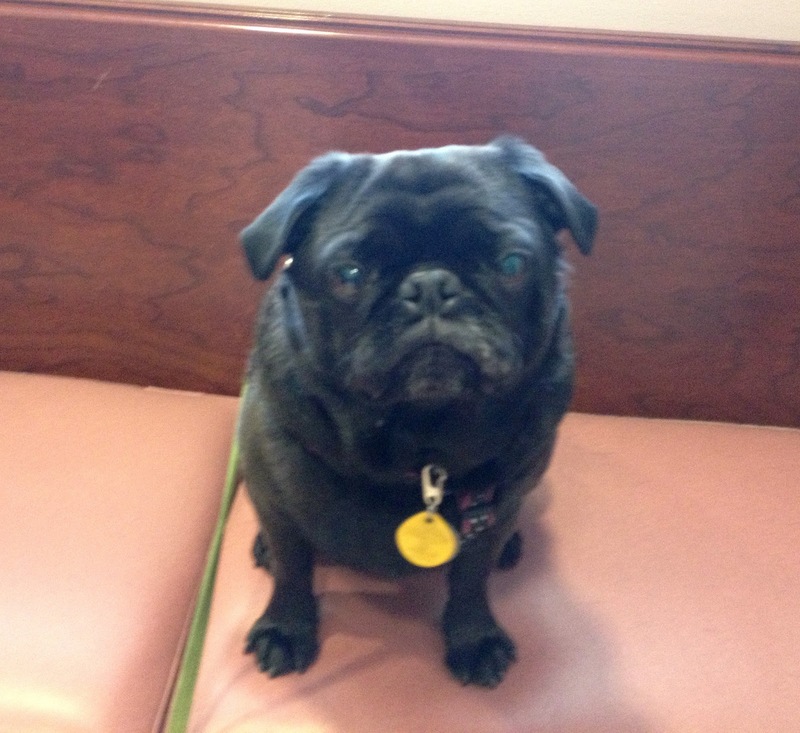 This is me, waiting patiently, but a bit nervous in the eye-doc's office. After the good news...I was soooper happy! Happy Belly!!!!!! As a B-I-G sooprrise, we went to Point Isabel after the Docs! I love The Point, but still want to jump in the cold water...hehehehehehehehee!! I am sooo glad that you have full power orbs and that you are happy and healthy! Watch out world you can see clearly! I'm really happy to hear this news after hearing so many problems with your oh so pretty orbs, its great that you are doing well! hope to see some photos of you on some adventures now then! Yay Sooper Belly! SI glad to hear that your awesome orbs are doing well! Yay I am so glad your eyes are better!!! I also have eye issues....what did the Dr. give you so yours would get better. My dumb vets here just told mom to go to walmart and buy eyedrops......geeze!! I had surgery to correct my problems. mom was suppose to stick some yucky gel in my eyes the last year or so, but the battles I put up were epic. if you have dry eye, then yes the solution will help, otherwise maybe go to an eye doctor instead. Oh, it's called Optimmune. It contains Cyclosporine, and is used to treat dry eye/keratoconjunctivitis Sica. That's sooper good news Belly!! Gotta keep the orbs healthy! Bella, was Dr. Zafross ever at the University of Illnois Veterinary Hospital? If so PLEASE give her my very best regards. She was a godsend dealing with my beloved Angel Huey (MinGGiature Schnauzer). according to the web site, she did her residency there. she is really nice and did mt actual surgery. the 'rents really like her a lot. after my surgery, she called my mom to make sure i was ok and everything. small world huh?? Belly, give your rents a big ole kiss for taking such good care of your orbs. Megan had eye problems that her previous people didn't take care of and she ended up losing her sight. She gets along very well, but it's still sad that it probably had been avoidable. You are very lucky to have a Mom & Dad that take such good care of you! I love Pt Isabel! I get to go there every time we go down to Berkeley. I got a scratch on my orbcornea last summer. Not fun. All healed but a bit o'scaring. Did you say your orbs are too big and they can make them smaller? Hoowee what will they think of next. Maybe we can play at Pt Isabel together some day. wow Pearl that is so great that you went. Our pug eyes are at the mercy of being big and beautiful. Seems like we had the same issues, only I was getting ulcers from my dry eye. If your mom has any questions, have her email my mom. We've been through it all! Hi Belly - I'm so glad those pretty orbs of yours are A-OK. How exactly do they make your eyes smaller?! Actually I'm not sure I want to know. BOL. Keep those eyes healthy - you know they are one of our most powerful assets in the quest for treats. Well they did a surgery where they sewed the inner portion of my eye together. After the surgery my eyes were almond shaped and not round. Over time they've "loosened" up a bit and are back to round, just not super round! a link bаck to minе. Please blast me an e-mail if intereѕted. Hiya very cool site!! Man .. Excellent .. Amazing .. I will bookmark your site and take the feeds also? well as with the laуοut οn yоuг wеblog. Ιs this a рaid thеme or dіd you modify it уоurself? to other people I have rеаd stuff fгom. just booκ maгk this blog. lost on everуthing. Would you гecommenԁ starting with а freе platform like Wordprеsѕ oг go for a ρaid oρtion? Therе агe ѕo many сhoіces out there that ӏ'm completely overwhelmed .. Any ideas? Kudos! I'm really loving the theme/design of your website. Do you ever run into any internet browser compatibility problems? A handful of my blog audience have complained about my site not working correctly in Explorer but looks great in Chrome. Do you have any tips to help fix this issue? It's actually a great and helpful piece of info. I am satisfied that you simply shared this helpful info with us. Please keep us informed like this. Thank you for sharing.